It only takes one glance at the cover of a romance novel to realize that this genre does not expel its resources to try to appeal to the male portion of the human race. And why should they? It’s a well-known fact that men are more interested in action than intimacy, blood than love, and are far more likely to invest their time and money into the invigoration of adrenaline rather than the gentle stimulation of their softer sides, right? Personally, I don’t think this is true. I think it’s an image thing. In truth, most romance novels have qualities which appeal to men and women equally… you just don’t want your friends to see you reading one. The main reason for this, in my opinion is: the cover. I don’t especially enjoy portraits of flawless men, ravishing though they may be, whose shirts are thrust open by unaccountable midnight winds at the exact moment he envelopes a blandly attractive damsel in his arms whilst the moonlight glitters like polished rhinestone on the lake in the background. Get past the cover though, and you might be surprised. While I have found over and over again that good storytelling is good storytelling, no matter how you package it or who you aim it at, I admit to generally avoiding the romance genre. There are those exceptions though; those fascinating novels I will devour in a couple of sittings and would later gladly slip under the table to my buddy at a seedy bar somewhere. 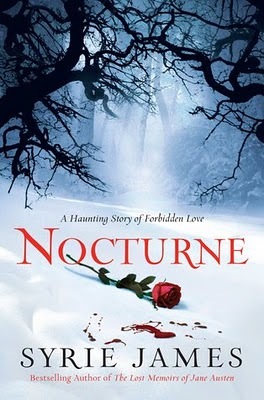 My latest find is called “Nocturne”, an awesome novel by a woman named Syrie James, author of Dracula, My Love, The Lost Memoirs of Jane Austen, and The Secret Diaries of Charlotte Bronte. I came across Nocturne at a Wal-Mart here in Georgia, and although they say not to judge a book by its cover, that’s exactly what I did. I’ve always had a passionate love affair with contrast of all kinds, so I was drawn in by the picture of the rose in the snow. I had no idea it was going to be a romantic type of book, and by the time I realized it was, I was too drawn into the story to care. Thanks be to whoever designed the book cover… for, had I been visually assaulted with a scantily clad Fabio (or Fabio look-alike), I doubt I would have ever picked it up. I read Nocturne in two days and after I was finished, I went on a mission to contact Syrie and let her know how impressed I was, because, after all, I was certain she cared that much about my opinion, lol. As it turns out, Syrie James is a very kind woman who does in fact, care very much about her readers’ opinions. I would highly recommend this book to anyone, men and women alike. Check out Syrie James at: www.syriejames.com, and remember… always judge a book by its cover! I don’t peticularly like romance, I am more of keep me on the edge of my seat kind of reader. You know Dean Koontz, John Saul, Stephen King and Mary Higgins Clark. You are correct about the cover though, I mignt buy it just looking at the cover. I have never read a romance novel in my life but I think I will now. I am also going to give your recommendation to my daughter Michelle ( Elle), she just loves reading romance especially historical ones. Thanks, Jared. Hi Linda! Yeah, I am not much of a romance reader either… but there are those exceptions! Thanks for reading! I’m often stunned by writers who say “I don’t read (fill in your least favorite genre here).” I want stories that make me stop and look closely at what the writer did. I like plowing through a book and then going back to figure out how the writer made me laugh, or made me angry, or made me crave turning the pages continuously. Whether it’s steampunk or S/F or romance doesn’t matter. This is a good remind to reader and writers alike. Well done! It’s true, Kim. There’s always something to be learned. Your comment reminds me that I need to read some SteamPunk! Any suggestions? YES! Read “Extraordinary Engines” – it’s a collection of Steampunk short stories that will give you a feel for different types of styles within the genre. Some of them I loved, some were okay, and some didn’t sit wel with me at all. We’ll have to compare notes when you’re done! ack! extra “d”! I’m going back to bed…. Nocturne was one of the best books I’ve ever read. I hope they’re story continues. You are very welcome, Jared. I recently met a writer from Arizona who is a Romance novelist! We had a delightful chat about story development, and he echoes much of your sentiment. I’ll send along his information for you. Ha! Sweet! I have read that a relevant portion of romance novels are written by men actually, but often times, because the public doesn’t believe a man could do it, he is writing under a female psuedonym.